Present state: Station building is in private occupation, it has been extended on one side. The Inverness platform and the goods loading bay on the opposite side of the road are both extant. Notes:For many years there has been a campaign for a rail connection to Inverness Airport. Following a feasibility study a proposal for a new Dalcross Station serving the airport was announced in June 2006. If built as planned the station could be open by 2008. The original proposals to construct railways to Inverness were made in the mid-1840s. Rival routes were proposed from Perth and Aberdeen. A line between Perth and Inverness was considered too hilly for the locomotives of the day, but the Great North of Scotland Railway (GNSR) from Aberdeen was authorised. The GNSR struggled to raise capital in the post-railway mania period and eventually started construction as far as Huntly in 1852, opening that line in 1854. The people of Inverness then stepped in and started building their own line from the Inverness end, initially as far as Nairn, the Inverness & Nairn Railway (I&N) was opened on 7th November 1855 with intermediate stations were opened at Culloden, Dalcross and Fort George. There is no industry in the area of Fort George Station which was opened to serve Fort George on an isolated spit of land jutting west into the Moray Firth at Ardersier, 3 miles north west of the station. Fort George was built after the Battle of Culloden in 1745 and was one of the strongest fortification ever built in the UK. The huge fort covers 42 acres, and was designed to provide all the facilities of a small town. 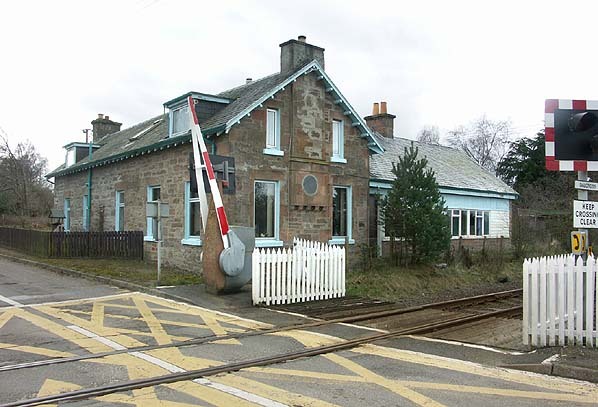 Another intermediate station was added at Cawdor on on 1st December 1855. This station was short lived. It was renamed Kildrummie in 1857 but last appeared in a public timetable in January 1858. It continued as a private Platform for the Earl of Cawdor until about 1880. 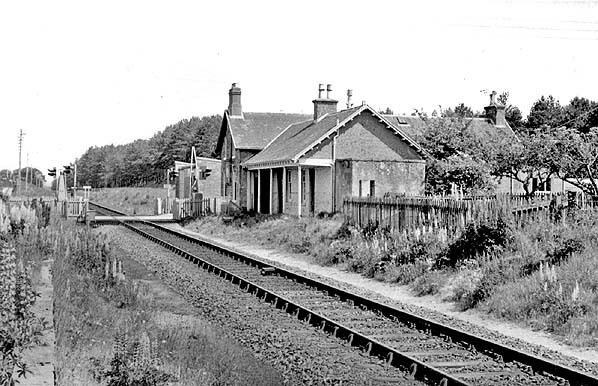 By the time the Inverness - Nairn line opened, plans were being made to extend this railway to meet the GNSR. After some discussion, the Inverness & Aberdeen Junction Railway (I&AJ) was promoted to build the line from Nairn to Keith where it met the GNSR extension from Huntly. The I&AJ was completed on 18th. August 1858, when it took over the working of the I&N. The I & AJ itself was was incorporated into the Highland Railway in 1866. The Highland Railway opened a short branch between Fort George and Ardesier to serve the military base on 1st July 1899. The station at Ardesier was also called Fort George and on opening, the original Fort George Station was renamed Gollanfield Junction. The station was later resited a short distance to the east of the junction. Another intermediate station between Allanfearn and Dalcross at an unknown date. Castle Stuart Platform was an untimedtabled private halt. The only reference to it is in the Railway Clearing House handbook for 1938 where it is listed as handling passengers and/or parcels. The Highland Railway became part of the London Midland and Scottish Railway in the 1923 grouping. Passenger services on the branch line were withdrawn on 5th April 1943 although troop trains continued to use the line until it was completely abandoned on 11th August 1958 when freight facilities were withdrawn. With the closure of the branch Gollanfield Junction was renamed Gollanfield in March 1959. The freight service on the remaining intermediate stations between Nairn and Inverness ceased on 27th May 1964 with the passenger service being withdrawn on 3rd May 1965. Passenger services are still provided by ScotRail between Inverness and Aberdeen. Dalcross Station in March 2007 - the position of the station clock is visible between the windows in the centre of the station building.